Quebec must get over its collective identity crisis and adapt to the realities of a secular, pluralistic society, says a provincial commission's report. The time has come for Quebec to get over its collective identity crisis and adapt to the realities of a secular, pluralistic society, says a provincial commission's report on the thorny issue of reasonable accommodation. "The foundations of collective life in Quebec are not in a critical situation," said the Bouchard-Taylor commission, in its final report on the state of so-called reasonable accommodation of religious and cultural beliefs. 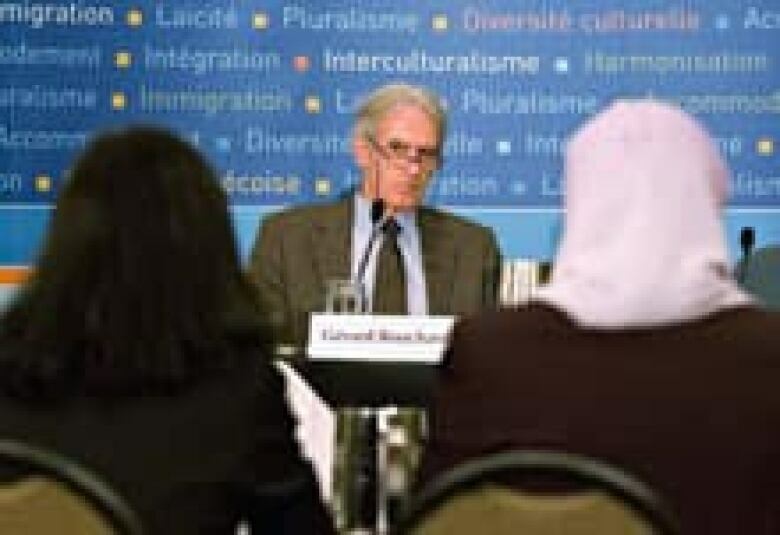 "What we are facing, instead, is the need to adapt," and the government must play a leading role in establishing better guidelines for "interculturalism," concluded the authors, sociologist Gérard Bouchard and philosopher Charles Taylor, in their 300-page report. "The report is not putting any guilty feelings on anybody," Bouchard said in French at a news conference in Montreal on Thursday, following the document's release. "Rather, our approach was to identify problems, issues ... evaluate the very nature, the scope of the issues, seek out the causes, find explanations and enunciate what solutions might be at hand," he said. The report summarizes months of public hearings held last year across the province that explored the impact of religious accommodation on Quebec's identity and values. Those meetings exposed many anxieties felt by Quebecers of French-Canadian descent about the apparent threat of accommodation on their identity. The commission said insecurity was largely fuelled by a "crisis of perception," stoked by distortions in media reports on individual cases of accommodation. The report also emphasized that Quebecers of French-Canadian descent, even though they are a minority in North America, remain the ruling majority in Quebec, where their collective identity is protected. But efforts need to be made on all sides to help Quebec society evolve, and the "responsibility of integration and intercultural relations is shared by all Quebecers — and not by one group of the other," Bouchard said in English. "Immigrants are called upon to share, to join the fundamental values of Quebec society," Taylor said at the news conference. "They're called upon to learn French, and they're called upon to participate in the day-to-day life and to integrate ... into Quebec society. "In exchange, the whole society must give them the tools to do all this." Quebec is entering a new phase in its history marked by a shift in selfhood, which is "no longer a French-Canadian identity," Taylor said. "It has become a Quebec identity. But such identity must be an inclusive type of identity." "All those who live here, who work here, who make their life here, who are part of our society are Quebecers, regardless of their origins." The province needs to define its secular nature to improve relations between the majority and ethnic minorities, said the commission. That includes greater measures, statutes and guidelines to counteract discrimination. But accommodation should not be overly legislated, the report notes. It's up to individuals and community groups to work out how they will accommodate each other on a case-by-case basis, respecting provincial guidelines while drawing from collective experience from past situations requiring compromise, it says. 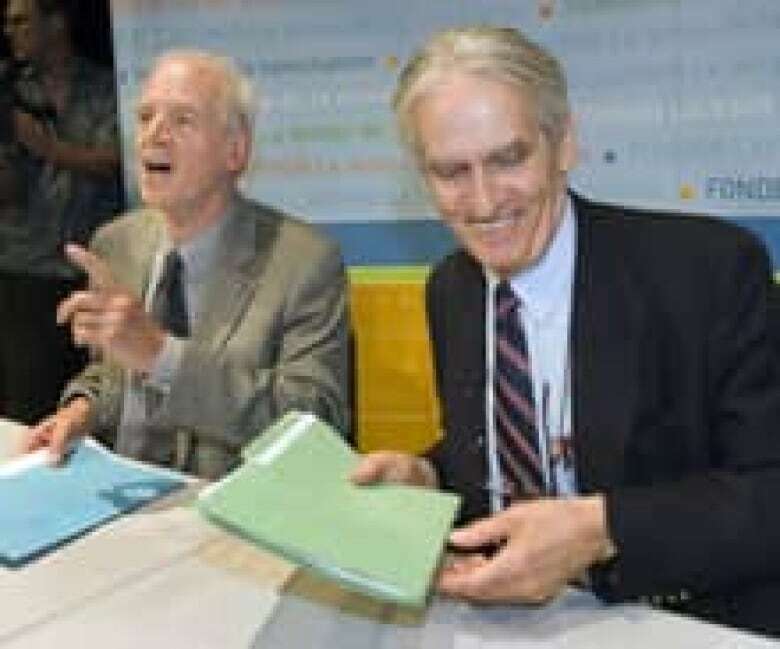 Sociologist and historian Bouchard and philosopher Taylor were co-chairs of the Consultation Commission on Accommodation Practices Related to Cultural Differences, which began province-wide public hearings last September. One of the 37 recommendations put forward by the commission was to prohibit provincial judges, Crown prosecutors, police officers and prison guards from wearing religious signs and clothing while on the job. Teachers, health-care workers and students, however, should be allowed to wear hijabs, kippas or other religious wear or symbols, the report said. The report also suggests enshrining interculturalism in a statute, policy statement or declaration at Quebec's national assembly. Moving the crucifix from the national assembly to a nearby part of the provincial legislature would also help emphasize the government's secular nature and function, the report says. Prayers should also be eliminated from all municipal council meetings, the commission said. Quebec's national assembly voted unanimously to reject the commission's recommendation to remove the crucifix hanging over the Speaker's chair. After tabling the motion Thursday, Premier Jean Charest said the religious icon reflects Quebec's cultural and institutional heritage and should stay where it is. 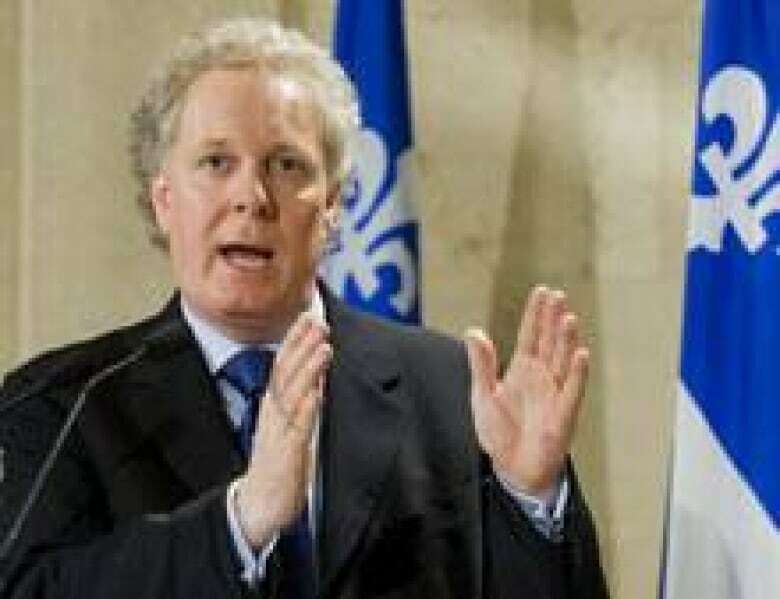 But he welcomed the spirit of the report, stressing its importance in Quebec's public debate over common values, which Charest said include the primordial importance of French, and gender equality. The Liberal minority government will take some time to read the report before issuing its "action plan", he said. But the government is ready to make more demands on immigrants interested in living in Quebec, including a signed declaration that states their commitment to the province's core values, including the importance of French. "The goal is to make it very clear [these values] are our values as Quebecers," Charest said in French. "That way we can understand each other and live together." "Immigration is not a right. Immigrating to Quebec is a privilege," the premier said. "And welcoming immigrants is the responsibility of all Quebecers. Between the two, we have to know where to draw the line. And Quebecers have the perfect right to decide in what kind of society they want to live." Opposition leaders described the report – and government reaction – as timid and failing to address Quebec's identity crisis. "It wasn't worth all the trouble for so little," said ADQ Leader Mario Dumont, who reiterated his desire for a Quebec constitution to enshrine the majority population's common values, a demand echoed by Parti Québécois Leader Pauline Marois. The recommendations of the Bouchard-Taylor commission don't provide any antidotes to the identity crisis the majority of Quebecers feel, Marois said. "We think the commission's report bypasses what is essential," she said Thursday from the provincial legislature. "It only goes one way, even though there is an identity crisis in Quebec that we have to address — we, the representatives of the people." Bouchard and Taylor should come to the legislature and explain why they "glossed over" the identity polemic, Marois said. Federal Liberal leader Stéphane Dion, who hadn't yet read the report, said he believes diversity is one of Quebec's selling points. "I'm very confident in our ability to make sure that in Quebec, and everywhere in Canada, diversity will remain a strength, and not something that will [or] should worry us," he said from the Eastern Townships. "We are stronger because we are able to be united with a very diversified country." Early reaction to the report from some of Quebec's community organizations was positive. 900 briefs were submitted by groups, individuals, associations. 241 people testified during 31 days of hearings. 22 additional regional forums were held. 13 research projects were commissioned and completed by academic researchers. 31 extra focus groups were held. The commission hearings broke ground on a touchy subject in Quebec and the report is promising, said Salam Elmenyawi, chair of the Muslim Council of Montreal. "The [proposed] solutions, the remedies, were very good, and at least it sets the stage for us to talk together with a different discourse," he said Thursday. "This, I think, is very positive." "This report is certainly going to create a new path for Quebec as a whole, in terms of how we live together and how we're going to deal with different forms of diversity," said Fo Niemi, co-founder of the Centre for Research-Action on Race Relations. Educational institutions are not required to offer permanent prayer rooms, although they should grant temporary space on an ad-hoc basis. The government should make sure its immigration quota reflects resources available to integrate newcomers into Quebec society, especially when it comes to jobs. Quebecers should adopt a multilingual attitude that includes more willingness to learn English and other languages, but not at the expense of French. Gender accommodation that compromises equality should not be allowed, especially in health-care settings. The government should increase funding to community groups that help newly-arrived immigrants, and organizations that promote intercultural dialogue. Quebec should come up with ways to reduce the "extremely" high unemployment among Quebecers born in Africa who have been in Canada for less than five years. The government should speed up the process of recognizing foreign-acquired professional skills and training. Quebec should promote immigrant settlement outside the greater Montreal area, where nearly 87 per cent of the province's newcomers live. YOUR VIEW: What do you think is working or not working in your community to help new Canadians?